Today marks two very exciting days in one: my little blog's first birthday and the first day of Fall! Crazy to think I've been blogging for an entire year now! Things have definitely slowed down since moving to NYC but I am working on that! I just need Internet and we should be good (we've been tapping into the nearby Megabus station so it's been spotty lol). I'm really looking forward to where the blog takes me and I can't wait for you to come too! Also, today marks the first day of Fall - one of my favorite seasons of them all! 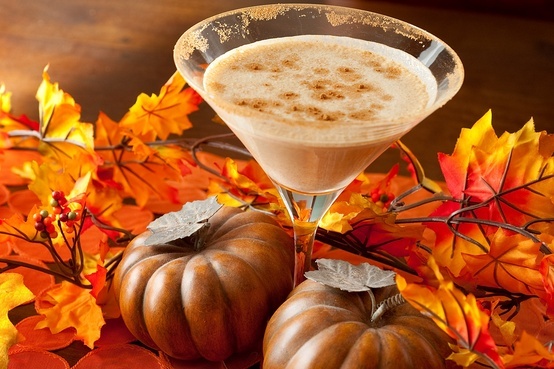 So, here's a little pumpkin pie martini to kick the celebration off right! Happy Saturday (and Fall!) everyone and thank you for reading!! Your kind comments make my day :). Happy Happy Blog Birthday! That is so exciting! Many more to come for you :) After reading your tweet, this afternoon I went to Starbucks and got an iced Americano with a half shot of pumpkin syrup. Delicious and light compared to the latte!